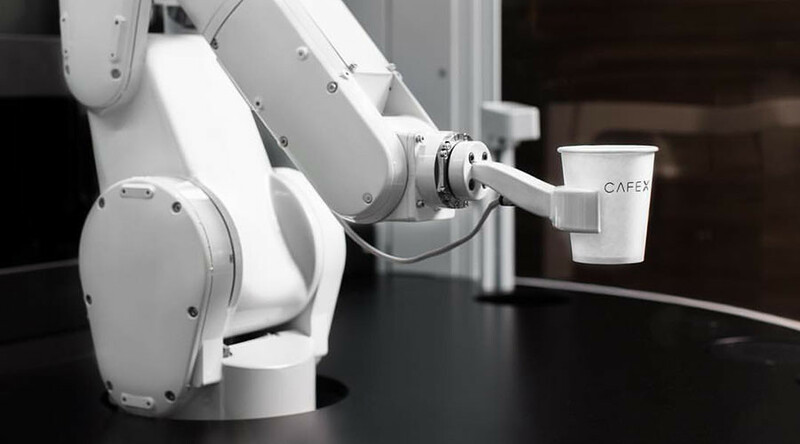 Baristas might soon be a thing of the past, as a tech-embracing coffee shop in San Francisco turns to streamlining robots capable of taking and delivering two orders a minute – and all at the touch of button. Designed to be completely hassle-free, customers can use an app on their phone or a kiosk in the Golden City’s Cafe X to place their order while the robotic arm, named Gordon, quickly goes to work. Customers then receive a text message to confirm their order is ready, along with a number they type into the kiosk before their coffee is served. Created by Mitsubishi, Gordon has the ability to pump out 120 cups of coffee per hour and only requires humans to refill coffee machines and explain the process to customers. Gordon also knows if a customer has collected their coffee. If the cup isn’t collected within six minutes, he picks up the coffee and pours it down a drain. “The idea came from spending a lot of time waiting in line at cafes.” Cafe X CEO Henry Hu told Tech Crunch, describing the venture as a more advanced version of the coffee machine in an office. This is the first time the technology has been used in the US according to Hu, who has a similar arm operating at the original Cafe X in Hong Kong’s Science Park.